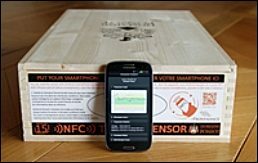 A new chapter has begun in the world wine transportation and storage with the introduction of 'intelligent' wine cases. Designed by Laurent Ponsot, winemaker in Morey-Saint-Denis, the process was developed by Franco-American enterprise E-Provenance. Each case of wine contains a sensor which records the temperature and humidity every four hours. Using a smartphone app, the client can, at any moment, view a history of the wine’s transportation and storage conditions from the moment it left the estate. The system calculates the impact of the temperature conditions on the wine and provides a score, which takes into account any potential degradation. Moreover, the producer or distributor can identify the client (with his or her agreement) and check the location of the batch. The sensors have a guaranteed lifespan of 15 years.